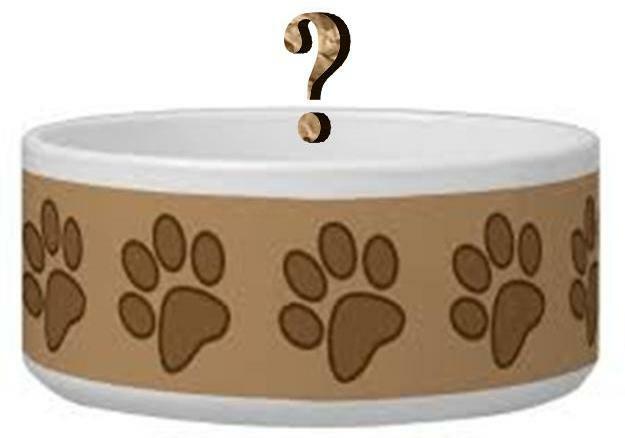 What are We Feeding Fido, and Why? My journey into the world of dog food ingredients began when my two-year-old mutts, Olive and Dexi, embarked on a hunger strike of sorts. They’d circle around their food bowls a foot away, sniffing all the while, only to walk away in protest before getting close enough to really get a good look. It felt as though they thought I might be trying to poison them, or at least pull a fast one of some sort. I served what I thought were top-tier kibble and wet foods, never skimping on price and offering plenty of variety to avert boredom. I changed commercial foods numerous times, trying every ilk of so-called natural lines marketed as organic, grain-free and the like, yet still my offerings were snubbed. I’ll never know if they actually conspired to get my attention, but get my attention they did when they’d go two days without eating a bite, ostensibly giving in only when hunger forced them to. I became convinced Olive and Dexi were rejecting the meals based on odor, inspiring my 3-part investigation into dog foods: first, to understand the canine sense of smell; second, to master commercial dog food labeling; and third, to discern what canine diet might really be best. I’ve concluded that the answer to the latter might not be as simple as one would wish. What we know about dogs’ ability to smell is beautifully summarized in a 2012 NOVA scienceNOW on-line article. It seems dogs might possess the most highly developed odor detection system on the planet, according to researchers at Florida State University’s Sensory Research Institute. A dog’s sense of smell is 10,000 to 100,000 times more acute than that of humans. An analogy applied to vision would be that something a human could just make out a half a mile away would still be visible to dogs at 5,000 or maybe even 50,000 miles. A well-controlled canine study published in 2006 documented discrimination of odors diluted to as low as 1-2 parts per trillion. This explains some dogs’ outdoor tracking skill and ability to detect early cancers in the breath and urine of humans. Dogs have about 50 times more olfactory receptors in their noses than humans, plus the part of the canine brain that processes olfactory information is proportionately 40 times larger. Furthermore, canine noses are designed such that about 12% of inhaled air is diverted to an elaborate olfactory apparatus in the back of the nose with a convoluted surface area lined with smell receptors. Whereas humans can’t take in new smells when exhaling because they inhale and exhale through the same aperture, dogs exhale from a separate side slit in each nostril , allowing them to separate breathing and sniffing functions. Consequently, they can sniff for odors continuously across many breathing cycles. They can also locate odors in space better than humans because they can tell which nostril carried the odor. What’s more, dogs possess an organ on the floor of their nasal passage which humans lack, called Jacobson’s organ, designed to detect pheromones that communicate sexual status, like readiness to mate. Learning about dogs’ astounding olfactory capabilities led me to wonder what might be lurking in even top-brand commercial dog foods which were failing Olive’s and Dexi’s smell tests. Although the U.S. Department of Agriculture and Food and Drug Administration do play roles in overseeing pet food regulations, standards for pet foods are actually set by a non-profit organization (Association of American Feed Control Officials, or AAFCO) which does not, however, regulate, test or certify pet foods in any way. Rather, AAFCO defines what pet food ingredients are allowed and sets standards for healthy products and package labeling. Individual states then apply AAFCO’s standards to set their own laws and regulations and insure that pet food manufacturers are in compliance. Understanding the nuts and bolts of AAFCO standards for labeling pet food goes a long way to empower pet owners to make informed choices about the dizzying array of products on market shelves. What follows is for dog food products, but the same applies to cat foods. For starters, the product’s name alone conveys valuable information about the contents. The rules go like this. Only when “100%” or “All” is in product name, as in 100% Beef or All Turkey, is there only one ingredient, save water and preservatives. Or, when the name is simple and unfettered, like Beef Dog Food, there is assurance that the named ingredient accounts for at least 95% of total dry weight (or 70% if the water is included). If that simple name identifies two ingredients, as in Beef and Liver Dog Food, then the first named ingredient must outweigh the second, and both must still account for 95% of dry weight. Modifiers added to product names which suggest better taste or nutrition – like dinner, feast, platter, entre, stew, or recipe – actually have no official definitions but do nevertheless convey useful information. Whenever a modifier is added (as in Beef Dinner or Salmon and Tuna Recipe), then only 25% of the final product need derive from the named ingredient(s) and the main ingredient might not even appear in the product name. When two ingredients are named, the first must outweigh the second, but the two together can still account for just 25% of total product. 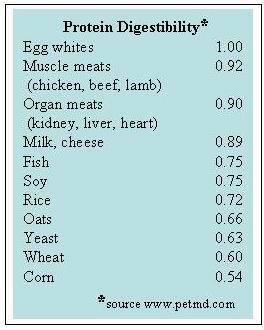 So it’s easy to see how a Beef and Potato Stew, for example, could be as little as 13% beef. If the name instead uses the word with, as in Dog Food with Salmon, the named component need make up only 3%. Contrast this with Salmon Dog Food which should be 95% salmon. Watch also for the words flavor or flavored, as in Fish Flavored: There is no minimum content required for the mentioned ingredient. So Chicken Flavored Dog Food might contain no chicken meat at all, just something that imparts a chicken flavor, like chicken broth or chicken by-products (see sidebar for definitions). The Complete and Balanced label is one of a handful that has specific meaning. A pet food qualifies as complete and balanced in one of two ways. For one, a product can meet a profile(s) for essential nutrients established by AAFCO for specific life stages, namely for puppies, pregnant/lactating females, adult maintenance (which permits lower amounts of certain nutrients), or all life stages. In addition to specifying appropriate levels of protein, fat and fiber, the profiles set required ranges for 34 amino acids, minerals and vitamins. Alternatively, a product can qualify as complete and balanced through feeding trials, targeting one or more life stages, in which dogs are fed only the test diet and water. A veterinarian evaluates general health at the trial’s start and finish. This method has been targeted for criticism on multiple counts. For starters, just eight dogs are required in a trial, and only six (75%) need pass. Necropsy is performed only on dogs that died. The adult maintenance trial is longest, 26 weeks, during which a 15% drop in body weight is deemed acceptable. Any mixture of breeds is allowed, so there is no allowance that the nutritional needs of, say, a working herd dog might differ from that of a lap pooch, except by calories. Laboratory testing is limited to a 3 or 4-component blood analysis at the end screening for only anemia and protein malnourishment (and, for adult maintenance, liver and bone disease). Labels on all complete and balanced products must state how the standard was met. My non-scientific survey found the nutrient analysis method to be far more common, probably because feeding trials are costlier. However, many products labeled complete and balanced weren’t tested directly because, once a lead member of a product family has passed, other products in the same family qualify too. Any food not meeting the complete and balanced standard must indicate that the item is intended for intermittent or supplemental feeding, though snacks, treats and supplements are exempt. Be aware that the additional healthful-sounding claims “perfect,” “scientific” and “100% nutritious” are just redundant to complete and balanced, but similar-sounding others, like “premium” or “holistic,” are meaningless. However, AAFCO specifies that “natural” denotes made without chemically synthesized ingredients, except for vitamins and minerals. And, an “organic” claim is meaningful when you see the “USDA Organic” seal: Though official organic standards for pet foods are still being developed, the seal assures that National Organic Program standards for human foods have been met, which exclude ingredients genetically engineered, irradiated, or grown with synthetic fertilizers/pesticides or sewage sludge. The basic rule for reading the list of INGREDIENTS is straightforward: All ingredients must be listed and in order of decreasing weight as they went into manufacturing. Under the heading GUARANTEED ANALYSIS are the minimum percentages of crude protein and crude fat and the maximum percentages of crude fiber and moisture, though manufacturers can opt there to highlight other additions, like omega-3 fatty acids or glucosamine. The descriptor “crude” is confusing, as it says nothing about the extent to which a nutrient can be utilized (i.e. digestibility). Crude protein reflects just the amount of nitrogen present (only proteins contain nitrogen). It’s critical to appreciate that a protein’s digestibility varies with the source. See Protein Digestibility sidebar, with egg whites assigned a reference value of 1.0. Which parts of animals (or plants) humans eat is culturally-based. There is no legal definition of the terms human-grade or human-edible, though federal regulations specify how foods have to be manufactured, packed and held to be deemed human-edible. Conventional pet foods are deemed “feed grade” based on the ingredients or how they were manufactured. A pet food would not be human-edible unless every ingredient met federal rules (including manufactured in a human food processing plant), so a product containing USDA-inspected human-edible chicken plus poultry meal, which is not human-grade, would not be human-grade. Though companies marketing pet foods made with all human-grade ingredients have surfaced, even then the label indicates that the food is not intended for human consumption. Born Free USA, an animal advocacy non-profit, put out a factual breakdown of “What’s Really in Pet Food” in 2007. It explains how the animal protein in most pet foods derives from the 50% of the animal carcass that’s left once the lean muscle, tongue and tripe are carved away for human consumption, leaving heads, feet, bones, blood, internal organs, etc. Thus pet foods are largely by-products of the human meat, poultry and fishing industries. Though it’s true that better brands of pet foods might not use by-products, the meat that is listed in the first ingredient(s) is still primarily leftover scraps. “Chicken,” for example, will not likely include the expensive breast meat but, because bones are allowed, likely includes the spine and ribs with the small amount of meat left attached. 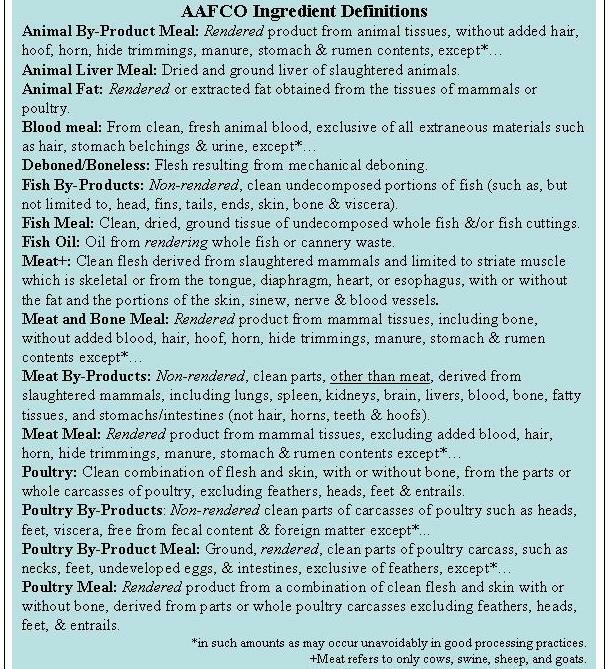 Official AAFCO definitions of common animal and fish ingredients are given in the Table below. Though not itemized, plant products are also often by-products of the human food system. Broken rice kernels, for example, are diverted to pet foods in the form of brewer’s rice. Be mindful that animal/fish ingredients identified as “by-products” are non-rendered whereas those named “meals” are. Rendering converts otherwise waste animal products into usable products through extended cooking which removes water and fats/oils and kills pathogens. In describing rendering, Born Free USA asserts that so-called “4D” animals (dead, dying, diseased, disabled) “are still legitimate ingredients for pet food.” A spokesperson for the Pet Food Institute, representing U.S. pet food manufacturers, confirmed that the decision to incorporate 4D animals or not is up to manufacturers. Though many people frown at learning what is allowed in pet foods, there are obvious environmental arguments for utilizing what the industry dubs “co-products,” i.e. the portions of animals or plants which humans elect not to eat. Diverting co-products to pet foods increases the sustainability of both pet and human diets as fewer resources need be inputted, and co-products would otherwise have to be landfilled or incinerated. Furthermore, the products of rendering capture seven times as much carbon dioxide as is released during rendering, according to the National Renderers Association. Any discussion of the natural diet for dogs begins with acknowledgement that all dog breeds are descended from the gray wolf, an apex predator. Gray wolves prefer to hunt large hoofed mammals, like elk, deer, moose, caribou and sheep, though they will supplement with smaller prey like rabbits, beavers, rodents, fish, waterfowl and even small reptiles and amphibians. They are also known to eat livestock, carrion and garbage. Even dogs are not off limits. Wolves store fat well so can go days and even a few weeks without feeding, but do gorge heavily when the opportunity arises. Also, their intestines are shorter than in humans, but food remains in the stomach longer so they feel full longer. Wolves are omnivorous in that they feed to a lesser extent on available plant materials, including berries, pears, apples, melons, and a range of grains and grasses, according to Russian mammal researchers. Renown wolf behavior expert L. David Mech at the University of Minnesota reports that wolves usually consume the internal organs of animals first – heart, liver, lung, stomach, kidneys, glands and spleen – before moving on to muscle meat. I mention this in that commercial dog foods generally market their products highlighting any muscle meat contribution. Obviously, wolves have no trouble eating raw animal parts and no doubt routinely ingest fur and plenty of bone. The domestic dog is one of many subspecies of gray wolf. This means that dogs can theoretically mate with gray wolves and produce viable offspring, and in fact there has been successful captive breeding producing wolf-dog hybrids. Exactly how and when domestication of dogs began is still subject to debate, though there is consensus that it dates back at least 10,000 years when wolves were drawn to permanent human settlements to feed on waste dumps. Over many generations, natural selection would have favored animals less fearful of humans who, in turn, came to appreciate that wolves could provide sanitation and an alarm to other intruders. The scores of contemporary dog breeds, however, is the result of selective breeding over the last few centuries, not natural selection. The lineage from gray wolf to domesticated dog has produced enthusiasm among some dog owners for return to an “ancestral” diet resembling that of gray wolves. An ancestral diet is touted as being significantly higher in protein and fats and lower in carbohydrates than conventional commercial dog foods. Consequently, there are wet and dry commercial brands now marketed as better approximating an ancestral diet. Some enthusiasts go so far as to recommend all raw components, and indeed there are many frozen and freeze-dried raw canine diets on the market, typically containing organ meats and ground bone in addition to muscle meat. However, as pointed out by John Bradshaw of the University of Bristol who studies human-animal interactions, we know little of the extent to which the biology of dogs has been modified by thousands of years of domestication. We do know, however, that hunting behavior has undergone significant change, as feral dogs subsist largely by scavenging rather than by hunting. Dogs also have smaller teeth, skulls and brains than wolves of similar body size. This first of its kind DNA study underscores that identifying a natural diet for contemporary dogs is not as simple as harking back to what their ancestor ate. What’s more, recent insights into a non-gene form of inheritance, called epigenetic inheritance, are bound to add another layer of complexity. An organism’s epigenome refers to a chemical apparatus that sits atop the DNA and regulates if and when genes get expressed. The epigenome is not fixed for life, but can change as a result of environmental influences, like chemical exposures. Furthermore, modifications to the epigenome are sometimes passed on to future generations without any change to the genes. Scientists are just now glimpsing how gene expression in laboratory animals is subject to epigenetic modification by the innumerable chemicals in industrialized society. The point here is that, because of selective breeding and industrial chemical exposure, the question of what constitutes the natural diet for dogs might no longer be meaningful. An anthropomorphized canine diet, in which dog food is evaluated through the lens of appeal to humans, has also gained in recent popularity. The diet roughly boils down to “don’t serve Fido anything you wouldn’t eat,” so all ingredients are suitable for human consumption. From the standpoint that canine domestication occurred in the context of scavenging from human waste dumps and table scraps, serving dogs some human-edible foods sounds deserving of merit. Already some dog foods marketed as human-edible actually undergo human taste tests. Perhaps this diet will gain in momentum as we understand more fully how dogs’ biology has diverged from wolves’. I personally have wondered if historical adaptation to human foods explains why my dogs reject raw vegetables but willingly scarf the same ones served al dente. Certainly one plus of anthropomorphizing canine food (assuming highly processed human foods are not on the menu) is that our dogs would be spared industrial scraps of questionable quality. However, the environmental burden of feeding dogs would obviously increase. Absorbing all the above, I’ve settled on a rather eclectic diet which is passing muster with both Olive and Dexi. It’s part ancestral, part commercial and admittedly anthropomorphized. Also, I hope it doesn’t rate too badly from an environmental perspective, though all dogs unavoidably leave an environmental “paw print.” Here’s my thinking, which I offer up most humbly, making no claims on knowing what diet is ideal for anyone’s dog (even veterinarians don’t agree). I respect that what people feed their pets is a personal a decision and realize that not all pet owners are situated to spend what I do on feeding dogs. I offer meals twice daily but no longer fret when Olive or Dexi skip a meal, knowing wolves don’t need to eat daily. Whenever possible, all constituents are organic to avoid industrial chemicals. For the main ingredient, I purchase plain, human-edible chicken, beef or turkey, pre-cooked because I eat a vegetarian diet and don’t want to risk introducing bacteria from raw meat into my kitchen. I’m also not willing to risk that my dog(s) might be among the minority that are less resistant to foodborne bacterial infections. I never buy fish because I don’t want to contribute to the collapse of ocean fisheries, plus meat protein is more digestible anyway than fish protein. On purely emotional grounds I also avoid lamb, veal, duck and pork. I admit to not really having tried organ meats as relished by wolves, strictly because of the yuck factor. Because I feel unqualified to approximate AAFCO’s nutrient profile by anything concocted on my own, I often add some “complete and balanced” high-protein kibble (free of by-products and by-product meals) and sometimes a canine vitamin/mineral supplement. Though my dogs don’t seem partial to canned dog foods in general, I steer clear of canned items primarily to avoid the endocrine-disrupting chemical BPA (bisphenol-A) in the resin lining which can contaminate the contents. I have discovered, however, a canned sweet potatoes or pumpkin for dogs that is BPA liner free. By the way, even though Olive and Dexi seem content with their current banquet, I have not given them complete veto power over what I serve, as I suspect they would happily gorge on heavily processed human junk foods and chocolate (which is toxic to dogs), if allowed. However, I remain vigilant to their behavioral reactions to their meals and committed to fine-tuning their diet further as I learn more about how domestication has impacted dogs’ biology and dietary needs. This entry was posted on Wednesday, February 26th, 2014 at 6:44 am and is filed under diet, health, sustainable living, waste, wildlife. You can follow any responses to this entry through the RSS 2.0 feed. You can leave a response, or trackback from your own site. 2 Responses to What are We Feeding Fido, and Why? I love all the research you’ve done. It sounds similar to my quest 6 years ago to find the best and most plastic-free way to feed my cats. We ended up settling on a homemade meal of ground turkey (my husband cooks it — I do am a vegetarian), baked sweet potatoes, and a supplement powder called Balance IT. Cats need far less plant food than dogs. In fact, they are obligate carnivores. Our cats loved the canned Instinct brand cat food we used to buy them, but I felt terrible about the BPA in the cans and all the packaging waste. It’s nice to feel like we know exactly what’s going into their bodies. Steve as always thoughtful and well researched. I guess what saddens me is that while the dogs get fed gourmet our VETS go hungry and alone on the streets and nobody is writing about their plight.